On the morning of Monday March 30th, prison officials at SCI Mahanoy say that Mumia Abu-Jamal had a “medical crisis” and was transported from the prison to the intensive care unit at the Schuylkill Medical Center, in Pottsville. PA. Shackled to the bed, alone, and prevented from knowing that his family is close by he remained in intensive care. Prison officials and hospital officials denied Mumia’s family access to visits, while also denied the family and his lawyers any information or records about his condition. His supporters and lawyers were at trial challenging the Revictimization Review Act aka the “Mumia Silencing Act” in Harrisburg, PA when they received word that he had been taken to the hospital. Have you ever seen yourself in someone else? Well, I see myself in Mumia Abu Jamal. Mumia and I have so much in common. We come from the same neighborhood and we both fight for social justice. When he was young, Mumia walked through the same hallways I walk through today 5 days a week at Benjamin Franklin High School. Mumia went through the same struggles that I face today as a high school student. I want to leave a positive impact on people like Mumia did. I want the whole world to know who I am and what I fight for. Mumia Abu Jamal was born in North Philadelphia in a housing Project in 1954. I was surprised to find out that Mumia went to Benjamin Franklin High School. When he was 15, he joined the Philadelphia chapter of the Black Panther Party for Self-Defense. He later became a journalist who provided important coverage on the MOVE bombings in West Philadelphia. On December 9th, 1981, Mumia was driving in Center City Philadelphia when he was shot and beaten by the police. He was charged with the murdered of the Police Officer Daniel Faulkner. Because of a lack of evidence Mumia was sentenced to death on July 3, 1982. This year, Mumia Abu Jamal celebrated his 60th birthday. For the next 30 years, Mumia sat on death row in torturous solitary confinement. But he did not stay silent. He continued to speak out, publishing seven books and recording reports for “Live From Death Row” on Prison Radio. Mumia inspires people to get justice for themselves. 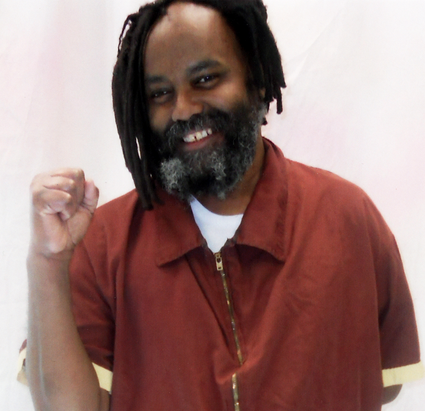 In 2011 Mumia was taken off death row and continues to fight for his freedom. Mumia Abu Jamal is a strong person that everyone should know about, especially at Ben Franklin High School. Mumia walked through the halls of my school but no students know about Mumia. I believe that Mumia should be taught in all Philadelphia high schools because he is just as important as Martin Luther King and Rosa Parks. The School District Of Philadelphia should have Mumia in the curriculum. A lot of students from Philly can relate to Mumia in many ways: he comes from Philly, he lived in housing projects, and he went to a neighborhood school. Mumia can change what people think about our society. Mumia inspires me to keep fighting. Even if we it takes a long time to win, we are being heard and that is important. I will never give up on fighting for a better education in public schools. Now that I’m a senior in high school, I fight even harder because I want better for the students that are still in school. PSU members attended a march and rally to celebrate Mumia’s 60th birthday and call for the freeing of all political prisoners. Mumia inspires me to keep fighting for my rights. I want to leave an impact on young people on why they are the most important in the education fight. I want to be a part of a movement of people coming together to fight for what they believe to make Philly better. Ever since I became involved with PSU, I have learned to never give up fighting because change is going to come. I have learned even if we lose, we are still winning because we are letting our voices be heard. We are showing that you can’t just make decisions without hearing the concerns of the people who are the most affected. So that’s why I keep fighting, so that I can show that I’m not afraid to let my voice be heard. Mumia never gave up fighting even while he is in prison today. He is still organizing and letting his voice be heard. I will never stop fighting for public education because it is important to have public schools. I will continue to go after Governor Corbett, because we need him to put money into education and not into prisons. All states should have a fair funding formula because all students should have a fairly funded school. The school-to-prison pipeline must end right now! Governor Corbett must think that all Black and Latino young people are going to fail. Well, I want him to know that we are not going to fail. We plan on succeeding in life, going to college, getting a good job and living a happy life. I will continue to keep organizing even after I become an alumnus of the Philadelphia Student Union and go to college. I want to keep fighting until we get all schools funded in Philly. 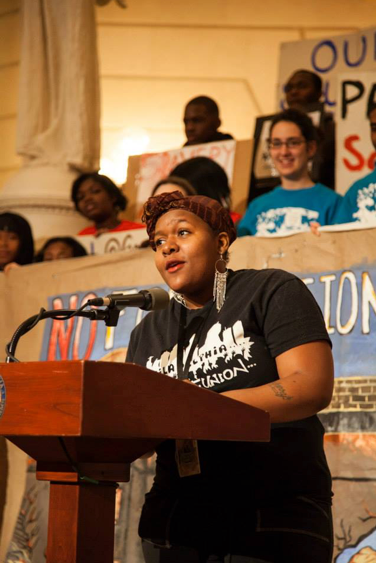 Sharron speaking in Harrisburg at a rally organized by Decarcerate PA. Photo by Paul Gargagliano. 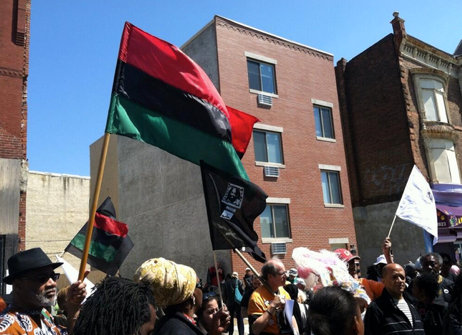 People all over the world are fighting to get Mumia out of jail. There is a Free Mumia Campaign that is happening and they are a group of people informing the world on Mumia and why he is a good person. They are also informing people on other political prisoners that are incarcerated. The Mumia campaign’s goal is to bring Mumia home but also to end mass political imprisonment all over the United States. The Mumia campaign is raising awareness like Chicago, New York, Los Angeles and San Francisco. Sharron’s essay was featured in our Spring/Summer 2014 edition of our student-written newsletter, The Union Rep. To recieve a copy of The Union Rep delivered to your doorstep for free, simply sign up and we’ll send you one!